After my mother’s funeral this week, I’ve been running on empty. No motivation. What to do during the times I always phone her to chat? What to do with the Valentine’s card I had for her? What to do on those holidays when I usually bake goodies to send to her? Decided I’d bake anyway. For me, baking is one of those auto-pilot kinda projects. Plus there’s always butter, flour, and sugar in my house. 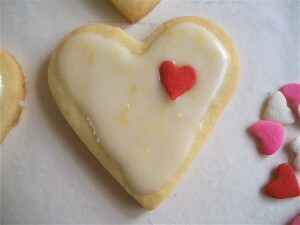 I wanted to create a Valentine’s sugar cookie with a bit of tang and happened to have 2 lemons in the fridge. I cut the cookies on the thickish side because I like them with a bit of crispness on the outside, but plenty of softness in the center. And because I think sugar cookies are kinda boring, I added lemon peel to the cookie dough then iced the finished cookies with a lemony glaze. 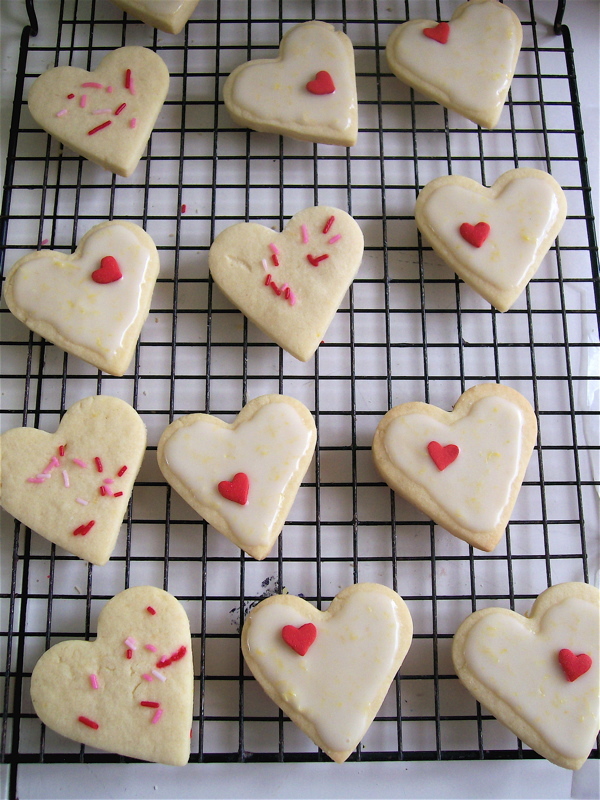 These are simple to make and just in time for Valentine’s day. You might want to change the title tho before serving them up to the love of your life! 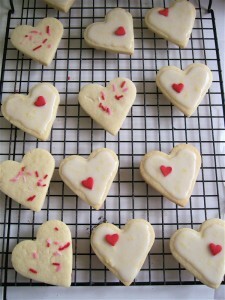 Most sugar cookies are similar. I used several basic recipes as models, then tweaked to my taste. This version is most like the Rich Roll Cookies from Joy of Cooking. I reduced the granulated sugar because I’m not a sugary-sweet person. I added powdered sugar because I like the lighter texture it offers. I also added lemon peel and boosted the vanilla to balance the lemony tartness, and I upped the baking powder. Not sure why! 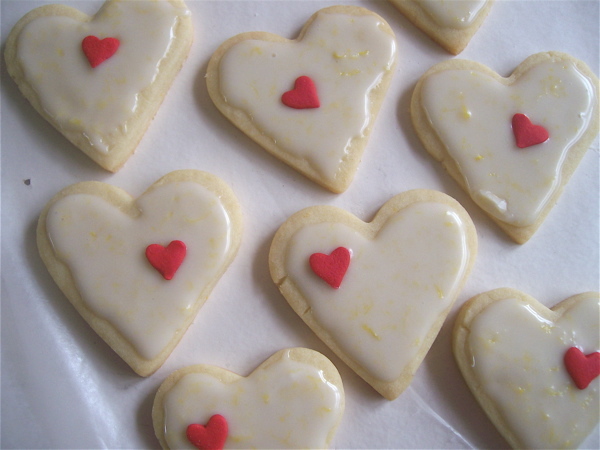 And I topped the cookies with a lemony glaze. You can add sprinkles before baking and skip the glaze, if you like. Bake 10 to 12 minutes or until edges get a hint of brown. Do not over bake. Remove to a cooling rack. When cool, frost with Lemon Glaze. They are very cute cookies 🙂 Grandma would have loved them! She was very proud of you! !